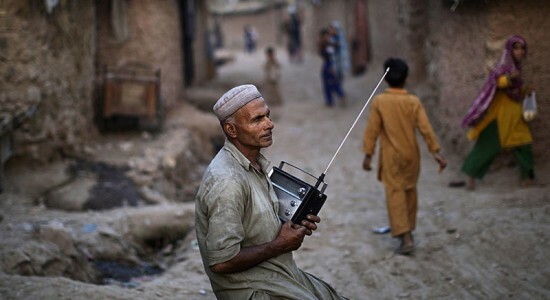 Close to the end of 2015 Pakistan has more than 140 functioning FM radio stations in the private sector. With TV completely dominating the landscape, and the government issuing new licenses from time to time what future do these FM stations have? Already they are witnessing a shrinking advertisement pie and static listenership figures. Many attending a seminar on FM radio in Pakistan in October 2015 in Islamabad agreed that the time to act was now or these stations would soon be out of business. At the seminar hosted by the electronic regulatory authority Pakistan Electronic Media Regulatory Authority (PEMRA) with BBC World Service, most of the FM radio owners in the private sector complained of not getting a level playing field as far as competing with state-run stations was concerned. “We got our licenses by investing millions of rupees, whereas, the revenue chunk is being shared by a number of state-owned FM radios who are not even PEMRA licensees,” complained an owner. State broadcaster Radio Pakistan and many others run by the Pakistan military do not come under PEMRA purview whose jurisdiction is restricted to regulating only the private broadcast sector. Therefore, they are not being watched over by anyone except the government. But the most financially damaging aspect of this equation for private stations is that these state broadcasters not only eat up millions of rupees of annual government grants but also are allowed to pick up advertisements from the private market. Najib Ahmed, CEO of Power 99 Islamabad, said owners can’t improve programming because each one holds more than two or three licenses in different cities. “We earn from Islamabad station and feed the others such as in Vehari and Abbottabad. If we are allowed networking we can do better than we are now.” He agreed that merely holding talk shows on radio does not amount to good radio and that owners are a bit greedy in securing more than one license. The experts also demanded the government relax the regulatory conditions so that they can broadcast some percentage of foreign content akin to the state-run radios. The private-commercial FM licensees also demanded PEMRA to strictly enforce non-commercial FM licensees to only operate within their ambit and scope. They proposed PEMRA and private FM licensees to jointly formulate a repository of content to overcome the shortage of content. They private broadcasters of Pakistan also proposed a regulated rating mechanism for FM radio sector for fair distribution of advertising business on the basis of reach and listenership of FM radios. Acting Chairman PEMRA Kamaluddin Tipu in his welcome note said FM broadcasting is contributing positively in spreading education, information and entertainment at grassroots level in Pakistan and are consequently creating awareness in society. This was the third seminar that PEMRA has conducted on the subject of FM Radio during 2015. All agreed that for the FM stations to survive they would have to create a niche for themselves in this cut-throat competition. There was also consensus that mere music would not hold the listeners glued to their radio sets for much longer and that private broadcasters will have to be innovative and interesting to its audiences and that running advertisements for long stretches will only end up scaring away listeners. The author is senior Islamabad-based journalist.